What Is Roberto Di Matteo Doing Right That AVB Could Not? 22nd June 2011: Chelsea appoint Andre Villas-Boas. “The Young One”, given the perceived unfeasible task of getting rid of the old, and drafting in the new. Yet the heralding of a new era was not to come, at least not under him. AVB’s reign was abruptly – crushingly – stopped in its tracks. Roman paused, looked and re-routed. He refused to make a rash decision by bringing someone new in. Instead, a “Still Quite Young One” was drafted in temporarily. Off the field, Roman and his posse of men can chart more carefully, meticulously going over every candidate, hopefully ones that can stay in the job for longer than five minutes. But on the field, one man is putting a massive case ahead for the permanent vacancy: Roberto Di Matteo. A man, whose previous managerial highlight would have been the dizzy heights of the Black Country derby. A man, who boasts no managerial silverware, is the same man who has guided Chelsea thus far to three wins out of three, as well as FA Cup and Champions League quarter-finals. The same man that has won as many matches as his predecessor in his last twelve league matches. What is Di Matteo doing that AVB, who won everything imaginable at Porto, could not? Pre-match, Di Matteo refused to lie. He did not go round the point. He was not bogged down in intricate detail, using fancy terminology, a characteristic of Villas-Boas. He laid it bare; it wasn’t just the biggest challenge of his footballing career, it was “the biggest challenge of my life.” He was prepared to confront the bleak reality of Chelsea’s season, and tackle it. He was not in a false sense of optimism. He was not vain. He rallied his players. He summoned up some old-school Chelsea fight. And he saw Chelsea through. Line-ups have been tellingly different from that of AVB. For a partnership that lasted eight months, RDM clearly did not pick up any points from AVB. And rightly so. Lots claim the first-leg Napoli defeat sparked the beginning of the end for AVB. Abramovich demanded to know why Cole, Lampard and Essien did not start. He arrogantly tried to faze out the old guard. It was a “I’m boss and I don’t care how big the match is, you obey” statement. And how they have made him to look like a fool now. Roberto was smart. He knew he could rely on his big-game players. Golden-oldies in Terry, Lampard and Drogba all scored. AVB underestimated not just the power of the trio, but the importance of them. For a man in the Chelsea seat, he ought to have taken a look at his opponent’s philosophy. Sir Alex Ferguson has not only managed to keep Scholes and Giggs fit, but kept them consistently good. He will not play them every match, knowing the fatigue of years of continued service. But he will always call on them for the big matches. AVB thought contrary, but paid a hefty price. 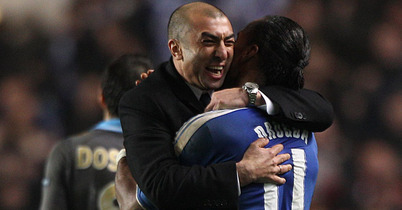 Di Matteo did not, and reaped the rewards. The tactics in the matches post-AVB have been unconventional, especially against Napoli. But Roberto is a clever man. The likes of Lampard and Ramires were in unfamiliar positions, yet both were up to the occasion, stuffing out the Three Tenors: Lavezzi, Hamsik and Cavani. The substitutes too were astute and meaningful. Torres was brought on to give their defenders another out-and-out striker to think about, and was lively throughout. Malouda was disciplined when Mata was tiring and found space hard to come by in a tight Napoli midfield. The Frenchmen, heavily criticised of late, nullified Napoli’s tremendous threat from wide, stopping Maggio counter-attacking. Bosingwa on for Terry was unconventional yet effective too. Ivanovic, though a tremendous right-back, is a natural centre-back, so it made sense to draft him inside to see out the final moments. Bosingwa could also halt the progression of Napoli’s wide forwards, who are at their best when stretching the pitch and running off the ball into space. It was a deliberate ploy to make it tight, and it worked. The passion was back in full force. Chelsea had not played a better match than that for some time. They were pumped up, an amazing change from lethargic matches seen under AVB. Where AVB tended to overcomplicate, looking into every aspect of football to microscopic detail, RDM sought to simplify. This was no time for revolution or evolution. This was about making full use of what he had. The humility is striking: “I am just focused on trying to win games and trying to get the best out of the players… What happens after is not important.” He turned into the galvaniser, more sports psychologist than tactical manager, more communication than discipline. He stripped Chelsea back to their dogged determination, went back to basics, and found a compromise between attack and defence. But crucially, he respected his warriors. He talked to everyone individually to start, to sort out any issues. He raised morale. He man-managed soundly. He has true passion for the club which did so much for him, and the love will have come across in the dressing rooms. The players were proud to wear the shirt. They fought and fought – and eventually conquered. Roberto Di Matteo, for whatever the summer brings, has made a mark where AVB could not. Chelsea are only the third English club to lose a European Cup first-leg tie by two or more goals and still progress. Perserverance, determination and tenacity has been restored. That match, will live long in the memory. Roberto Di Matteo, for all he won as a player, has written another chapter in Chelsea history. This entry was posted in Analysis, Andre Villas-Boas, Ashley Cole, Branislav Ivanovic, Champions League, Chelsea, Daniel Sturridge, David Luiz, Didier Drogba, Fernando Torres, Florent Malouda, Football, Frank Lampard, John Terry, Jose Bosingwa, Juan Mata, Michael Essien, Napoli, Petr Cech, Ramires, Roberto Di Matteo, Tactical and tagged Andre Villas-Boas, Champions League, Chelsea, Fernando Torres, football, Napoli, Roberto Di Matteo. Bookmark the permalink. I can’t think why I have never commented on this post. This is a nice look at how DeMatteo is different from AVB. Despite that though, I think another thing that was important that season other from the manager is the players themselves. Chelsea, pride of London. That certainly raised their morales in big games. Remember the last game of the Champions League group? The match against Valencia? They had drawed against Valencia once and if they so much as drew in the game, Chelsea would be out of the CL. Despite that, Chelsea, still under AVB at that time gave a phenomenal performance, much like that much under Napoli. Point is, managers will always be managers but its players that matter. But under the right manager, a player can shine like never before. DeMatteo is that manager for Chelsea and Chelsea did shine, brighter than any London club has done before. Absolutely. It’s a shame when things go wrong it is all on the manager’s head, but as you say, it is down to the players to perform; after all, they are the ones who can have a direct influence on any match, they are the ones playing on the pitch! Regardless, it is fascinating to see how different managers work. The group Di Matteo had was largely the group which AVB had last season, but whilst the latter couldn’t even beat Birmingham in the FA Cup, the former showed his worth by winning the Champions League. I think that was because of chemistry. DeMatteo and Chelsea had good chemistry whilst AVB only wanted to rule. While AVB wanted to be the boss of Chelsea, DeMatteo wanted to be their friend, another teammate. After years of being under the rule of a manager that Abrahimovich forced them under, getting a manager that is low key, that is very humble is a very different experience than any of the Chelsea players have endured. And thus, without pressure from a so called ‘great’ manager, they excelled under a ‘normal’ manager. What a fabulous comment. I totally agree with that, it’s brought up something which I never really thought of. The distance between manager and player went, yes. AVB seemed like a ruler and probably was quite condescending with his techno-babble; whereas Di Matteo probably cut back to basics and got each one on his side to further the club’s success. Spot on.